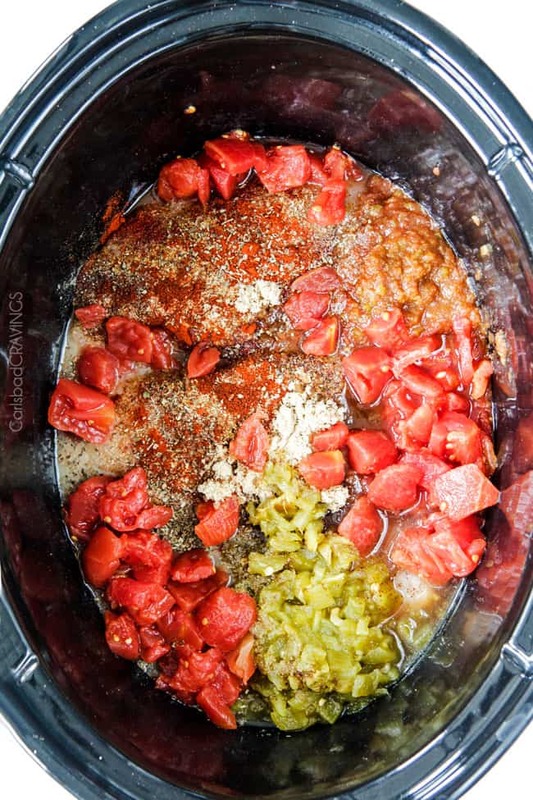 My crockpot just bit the dust and I was hoping to make this tomorrow! Do you have any idea how I could make this in a large pot instead? Cooking times etc? Thank you! Oh no! poor crockpot! 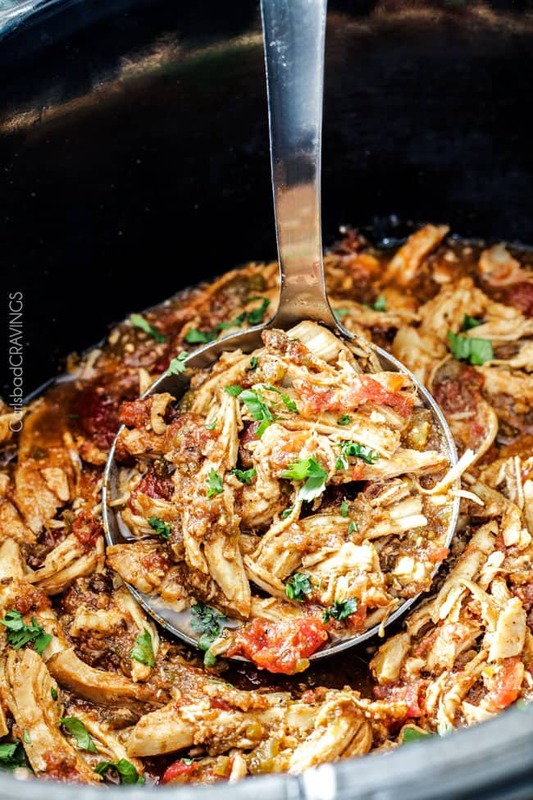 To make on the stove, add ingredients to a Dutch oven/stock pot and bring to a boil, then reduce heat to medium and let simmer for 15-20 minutes, turning occasionally Cover and reduce heat to low for 45-60 minutes or until the chicken shreds when you use a fork, adding more broth/water if needed. Hope this helps! Would this work with beef as well? Hi Ashlie, I don’t see why not! I would just cut your beef into smaller pieces like chicken breasts and proceed as directed. Let me know how it turns out! I’ve NEVER left a comment on a recipe before, though I am notorious for reading them all before I decide to make something. That being said, I was compelled to comment on this recipe. OMG! It was SO delicious. I followed the directions exactly, except I omitted the brown sugar and threw everything into a pot on the stove (my crockpot was mad at me today). I used the chicken to make chimichangas. Wow! Wow! Wow! I am thrilled to have found this recipe. Thanks SO much for sharing! If you never leave compliments than this is the ULTIMATE compliment – thank you, thank you! I am thrilled you loved it so much and it that it turned out just as delicious on the stove! YAY! I hope you find more recipes to love here enough to comment on 🙂 Thanks Tara! Awesome Leanne, so happy you enjoyed it – even with too much brown sugar 🙂 I am excited for you to try it again too especially because it makes great freezer leftovers! Thank you! 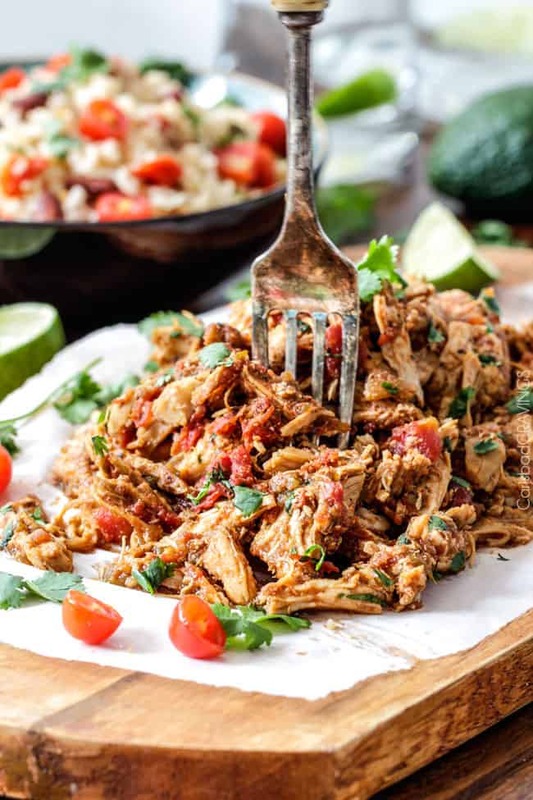 This slow cooking Mexican chicken is wonderful. My family thoroughly enjoyed it and look forward to having it again. 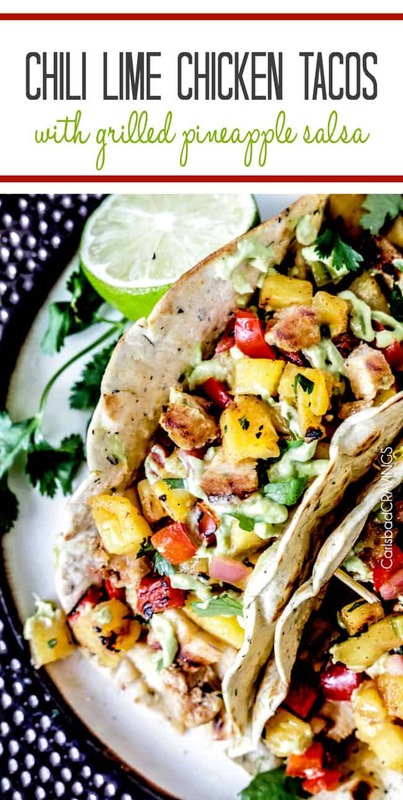 It was better than any Mexican restaurant chicken in town….. and we live right outside of New Orleans and have lots of good restaurant food. This was exceptional!! Thank you for sharing. Hi Rami, WOW, “better than any Mexican restaurant in town” made me smile ear to ear – what a nice compliment – THANK YOU so much!! Thrilled everyone loved it! Do you use hickory or mesquite liquid smoke?! Hi, I just recently made this slow cooker chicken and it was awesome!!! I will be making it again, but this time for a large crowd. I would like to make the rice you talked about, but you said use the leftover sauce to cook the rice in, how do I do that? Do I measure out the sauce for the chicken broth???? Help, please!!! ;). Hi Brittney, so happy you loved this chicken! For the rice, what I meant is to strain the liquid from the slow cooker chicken after its cooked then add chicken broth to the liquid to equal the amount of liquid you would normally use for the rice. 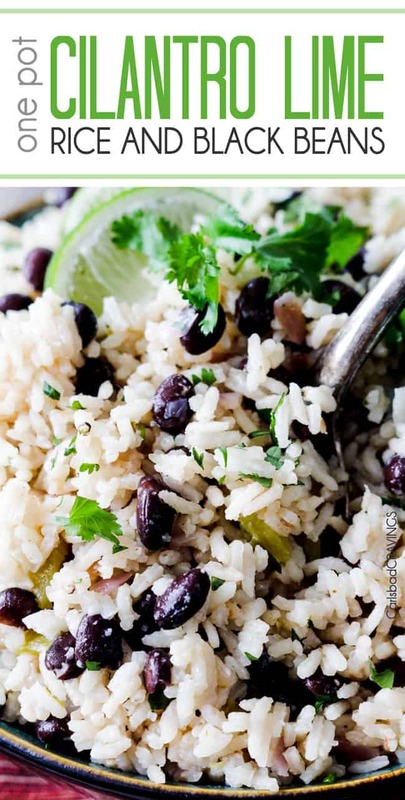 Another alternative if you want to have everything done at the same time is to make my Cilantro Lime Rice with Black Beans which is also great – you could even make this in a rice cooker after you saute the onions and jalapenos – recipe here: https://carlsbadcravings.com/one-pot-cilantro-lime-rice-with-black-beans/ Good luck! 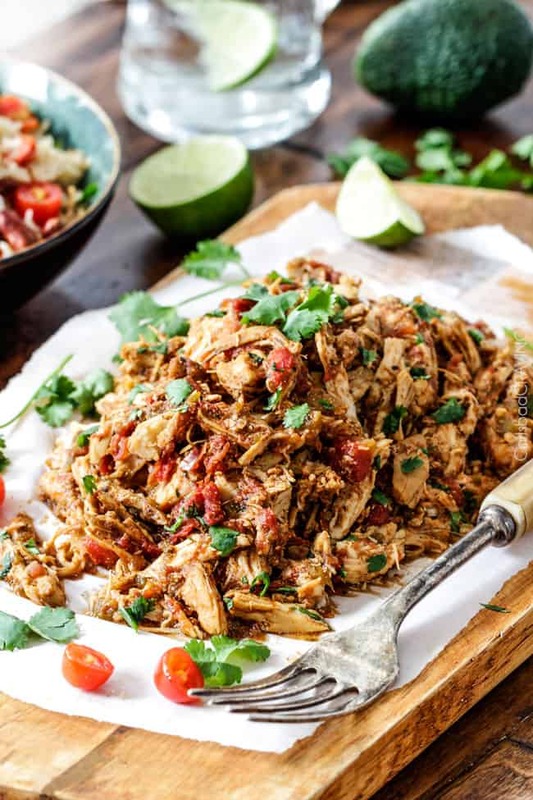 I never comment on recipes but this chicken so simple to make but so tasty too! 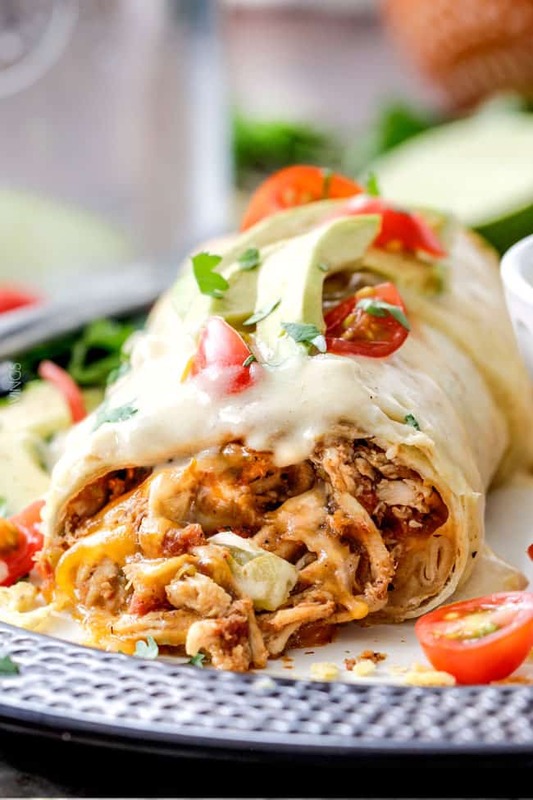 The chicken burritos with green chilie and sour cream sauce are to die for. This is a household favorite! Thank you! Wahoo! Thank you for making my day Olivia and taking time to comment! 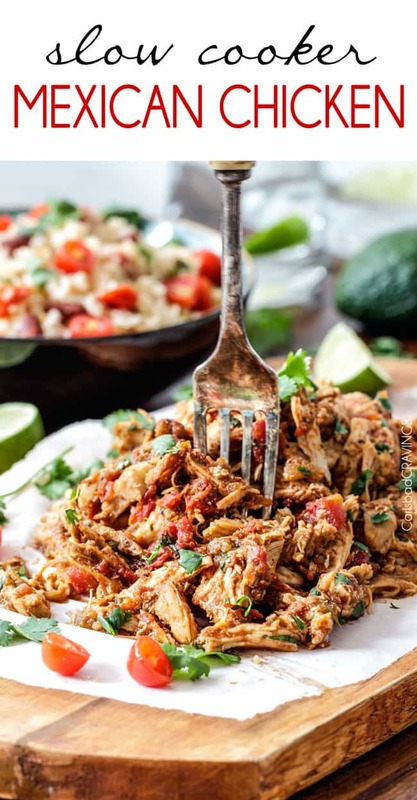 I am thrilled you not only love this chicken but the burritos as well! Made this last night! It was delicious and so easy. I did cut back the chipotle seasoning by half for the little one since he doesn’t like spivey food. 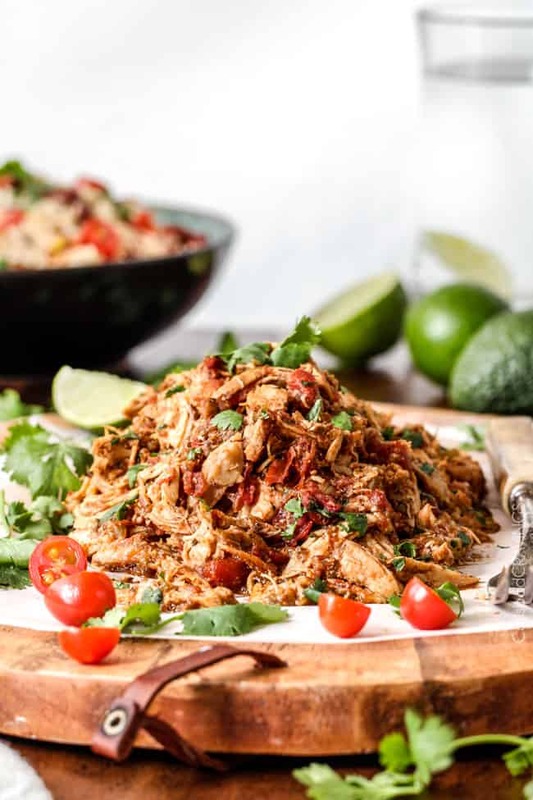 I have never enjoyed chicken as a base for my Mexican food until now! Thanks so much for the easy recipe! It’s going into my regular rotation. Hi Brandy, so happy to hear you loved this enough to make into your regular rotation – yay! It truly is so versatile and nice to have on hand. Thanks you for taking the time to comment! Made this yesterday as the stuffing for chimichanga. Amazing! Very flavorful. I had to use a Dutch oven to cook this since I don’t have a slow cooker. The leftover tastes even better the next day! Def a keeper! So happy its a keeper Joyce! Do you mind sharing your method in the Dutch oven? how long, temp, etc as I’ve had a few readers ask. Thank you so much! I rubbed the chicken pieces with the dry seasoning you’ve suggested and seared with olive oil. Add the liquid smoke and add the other ingredients. Cook on medium high for a few more minutes. Then I covered the lid and let it simmer for about 2-3 hours. When the meat starts to fall apart when poke with a fork, I increased the heat and kept a close watch til the juice evaporated. Hi Joyce, thank you so much for sharing, I really appreciate it!! I don’t have a can of green chilies or chopped/diced tomatoes, but I do have rotel. Do you think that would work out ok? That would be perfect! Enjoy! I am planning to try this recipe very soon! I would like to omit the brown sugar, though. Do you still think it will turn out ok? Hi Elizabeth, I would suggest making it without the brown sugar and then you can add it to taste if you find it needs it at the end. I think it helps balance out the heat and the acidity but you might be fine without out – or at least less. Enjoy! Hi Trisha, so glad you love this chicken! 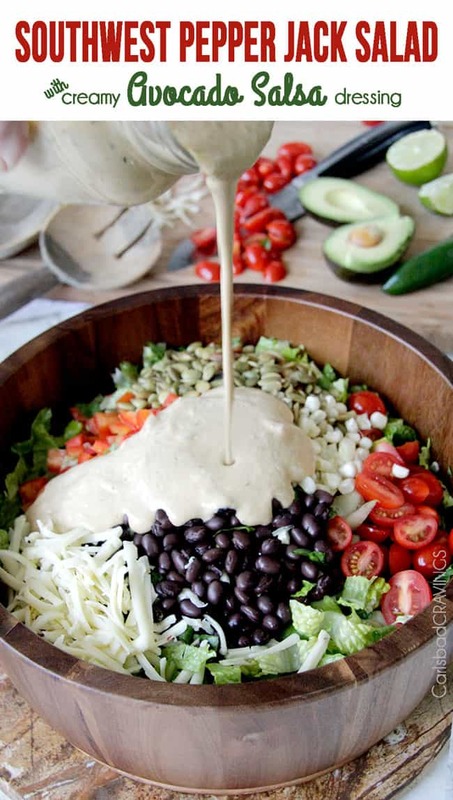 I think it would definitely work on nachos! I would just make sure to transfer it to a strainer and push down to get rid of any excess liquid. Enjoy! Hey! What’s the ideal chicken for this recipe? Boneless, skinless chicken breasts? Can’t wait to try it! That is what I use and love it! Enjoy! 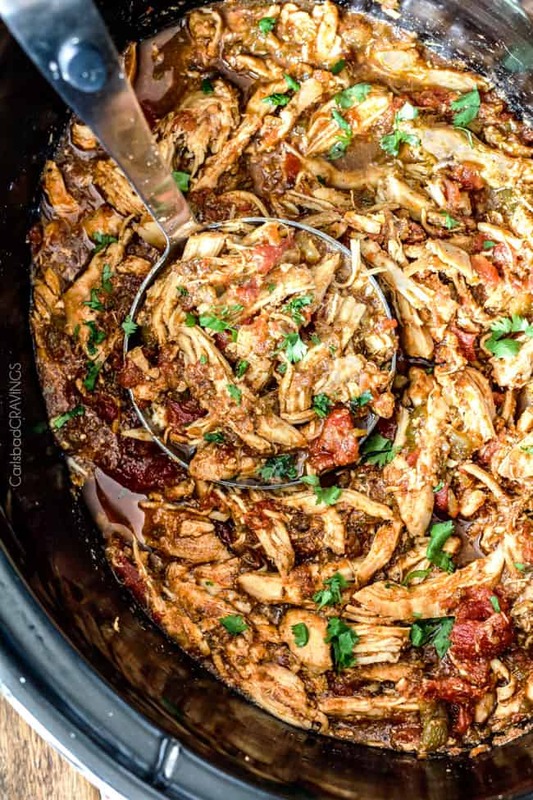 Made this last night in my Instant Pot, so quick and flavorful. Thanks for the recipe. You are so welcome Beth, so happy you enjoyed it. Thank you so much! I hope this is okay to post….Beth, would you mind sharing how you made it in the pressure cooker? I just got one, and would love to know. 🙂 Thanks! WOW! This was absolutely amazing… I can never serve my family the basic salsa chicken again… this is it from now on! LOL – no turning back! I am thrilled you loved this chicken so much, thank you Heather!! Can I use frozen chicken breast and rotel instead? Hi Laina, sorry for my delayed response as I am just getting back from Lake Powell without any service but thank you so much for your comment. Yes, frozen chicken and rotel would work just fine! Enjoy! This is one of the most flavorful meals I’ve ever made. The spice, the tender chicken, the perfect balance of heat, EVERYTHING is great! Love the addition of brown sugar against the chipotle pepper powder I add. Thus is a recipe I will keep for years to come. It’s delicious! Hi Spencer, sorry for my delayed response as I am just getting back from Lake Powell without any service but thank you so much for your comment! I love hearing this is a keeper for years to come and that “EVERYTHING is great” – wahoo! Thank you so much! Great recipe! Reminded me of why I always fill my suitcase with cans of New Mexican green chile and chipotle when leaving my native Colorado for my home overseas. Great stuff. Thanks! Thank you so much Michael, so happy you enjoyed it! And I can just picture your suitcase stuffed with green chiles and chipotle – delicious suitcase 🙂 All the best to you! Jen! I am about to throw all these ingredients in the slow cooker right now! I don’t have chipotle powder so I am thinking about replacing it with a little Ancho chili powder for some depth. Great idea to use the liquid for the rice!!!! Brilliant! The liquid smoke totally sold me on this recipe, love that stuff! Hi Jennifer! I also love ancho chili powder – I am sure that is a delicious substitute – hope you loved it! And I totally hear you on the liquid smoke-it just adds a little something-something. Still waiting to hear back from SheKnows- will keep you posted!